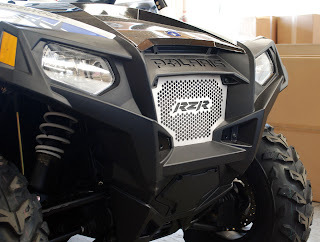 UTV Tech is proud to release a direct replacement for the 2011 plastic grill with an upgraded option that protects your radiator and adds a customized appearance to your Polaris RZR or RZR S.
The hex pattern utilized provides strength of the product and optimizes air flow to the radiator. The UTV Tech Radiator Protecting Grill is made of 0.100 aircraft-grade aluminum and can quickly be attached to your RZR using the existing hardware that holds on the stock plastic piece. UTV Tech, founded in 2008, is a division of VSM Technologies a precision sheet metal company that has been family owned for 30 years with customers across many industries, institutions, and government entities. UTV Tech can be found on the web at www.utvtecvh.com or by calling 208-522-1301.